Discover all that beautiful Lake Tahoe has to offer while staying at this charming property, within walking distance to the area's most popular shopping, dining, casinos and the Heavenly Gondola ride. 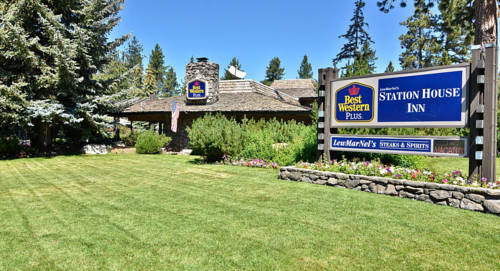 The BEST WESTERN Station House Inn is perfect for enjoying the year-round attractions for which Lake Tahoe is known. Experience world-class skiing at one of five nearby ski resorts, including Heavenly Valley, Kirkwood or Squaw Valley. In the warmer months, relax on the hotel's private beach or spend the day boating or fishing at Lake Tahoe. Hit the links at local golf courses, watch the Celebrity Golf Tournament, or take in views of the spectacular Grand Sierra Mountains. Don't forget to book a room for our popular New Year's Eve celebration while you're at it! Located just one block from beautiful Lake Tahoe, the BEST WESTERN Station House Inn is the perfect place to call home after a busy day. This 100% non-smoking, full-service Lake Tahoe hotel provides the best in comfort, convenience and customer service. Each well-appointed remodeled guest room or suite at this South Lake Tahoe hotel features satellite TV and free Wi-Fi access. We also offer two luxury vacation cabin rentals. This Best Western Lake Tahoe hotel offers first-rate amenities - from an outdoor heated pool and hot tub to an award-winning complimentary full breakfast, rated one of the top 100 breakfasts in America by Esquire magazine. For added convenience, we offer a full-service business center, complimentary shuttles to local attractions, and meeting facilities accommodating up to 65 people. And be sure not to miss our summer poolside lunch service and onsite fine dining restaurant, LewMarNel's Steaks & Spirits, recipient of a Wine Spectator Award for Excellence. The friendly, helpful staff at the BEST WESTERN Station House Inn is ready to ensure a fun-filled memorable stay in South Lake Tahoe, California. Make a reservation today and save. From: All directions. The BEST WESTERN Station House Inn is located 2.5 blocks west of Highway 50 on Park Avenue, 2.5 blocks west of casinos at Nevada stateline. 0.75 mile(s) from Forest Buffet, Bar/Lounge, American, Open for: lunch, dinner, Located in Harrah's Casino. 0.50 mile(s) from Fire + Ice, Full Service, American, Open for: lunch, dinner, Located in Heavenly Village. 0.75 mile(s) from Cabo Wabo Cantina, Full Service, Mexican, Open for: lunch, dinner, Located in Harvey Casino.